crafted with genuine leather.Light weight and comfortable. 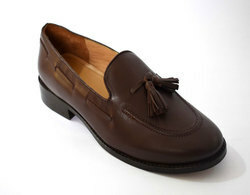 In order to meet excellent quality standards, we are supplying Leather Boat Shoes. All of the shoes feature breathable, moisture wicking uppers, super comfortable adiPRENE cushioning in the foot bed, and padding in the collar and tongue for a comfortable ride all day long. Add a pair of brown coloured moccasins to your closet and spice up your everyday style! Featuring laces on the vamp for dressy appeal, these suede moccasins are made to make a good occasion wear. It s TPR sole act as good shock absorbent leaving less stress on tow while offering best in class grip.